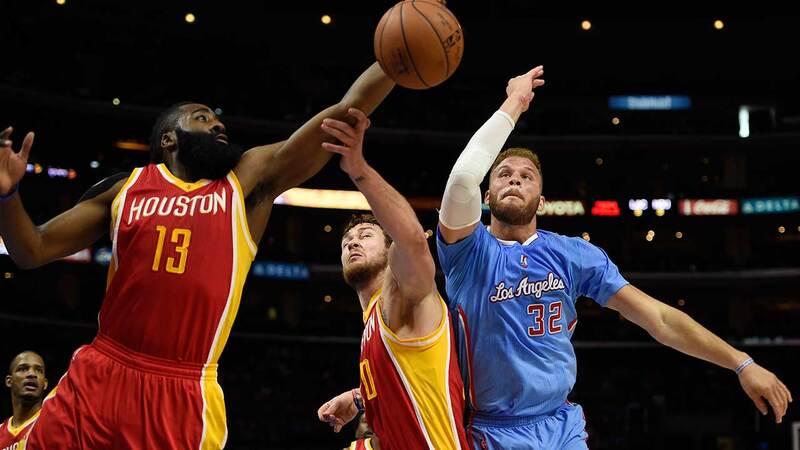 LOS ANGELES, CA -- James Harden scored 34 points, Terrence Jones had 16 points and 12 rebounds, and the Houston Rockets beat the Los Angeles Clippers 100-98 on Sunday to salvage a split of their four-game season series. Trevor Ariza had 19 points and nine boards, helping Houston move within two games of idle Memphis for the Southwest Division lead with 16 games left on the schedule. The Rockets haven't captured a division title since 1993-94, when they won the first of their back-to-back NBA titles under coach Rudy Tomjanovich. Chris Paul scored 23 points for the Clippers, but missed a five-foot fadeaway jumper at the buzzer. Blake Griffin had 11 points, 11 rebounds and eight assists in 40 minutes in his return to the lineup after surgery to remove a staph infection in his right elbow. DeAndre Jordan had 20 rebounds. Harden was 7 for 16 from the field and 17 for 18 from the free-throw line, missing his last one with 8.2 seconds to go. Austin Rivers and newly acquired Nate Robinson led Los Angeles on a 9-0 run that reduced a 12-point deficit to 86-83 with 8:42 remaining. Jones slowed the Clippers' momentum with a pair of tip-in baskets 46 seconds apart after Harden missed a jumper and a driving layup. Los Angeles then made another charge, tying it at 96 with a 13-3 run capped by Paul's jumper with 3:06 to play. But Jones hit a 3-pointer with 1:55 to go, and the Rockets got the benefit of an offensive foul by Griffin against Ariza with 12 seconds left after Ariza's intended pass to Harden was intercepted by Griffin. The Rockets, who converted 20 Clippers turnovers into 27 points, led 58-50 at halftime on 24 points from Harden and 14 by Ariza. Patrick Beverley's 3-pointer with 8:13 left in the second quarter ended the Houston's opening 0-for-11 drought from behind the arc. Griffin started out as a facilitator with four assists in the first quarter, setting up a pair of 3-pointers by J.J. Redick, another by Matt Barnes, and an alley-oop dunk by Jordan to help the Clippers build a 30-22 lead. That disappeared when Harden connected from behind the arc to put Houston ahead 39-38 with 5:32 left in the half. Thirty seconds before Harden's go-ahead basket, Barnes took him down aggressively as he tried to drive the lane - and received a flagrant-1 foul after the referees took a closer look at the replay. Barnes, who scored 14 points in the opening quarter, finished with 19. Rockets: Dwight Howard was sidelined for the 22nd straight game because of an injured right knee. He has missed 34 altogether this season, and the Rockets are 18-16 with him out of the lineup. ... Houston has won 17 games this season by a margin of six points or fewer. ... The Rockets are 30-3 when allowing fewer than 100 points. ... Houston has won only three of its last 14 meetings with the Clippers. It snapped a seven-game skid against them at Los Angeles. Clippers: The introduction of the Clippers' starting lineup was handled by Kermit the Frog on the videoboard. ... Barnes came out early to practice his free-throw shooting and got his shoulder loose by slamming the ball against the glass several times from the line. ... The Clippers were 9-6 in Griffin's absence. "Not having Blake hurt us in a lot of ways," coach Doc Rivers said. "Teams were able to trap C.P. far more than they can when Blake's on the floor because of Blake's ability to pass. I'm sure C.P. is the happiest of all of them to have him back. I think it will really help D.J. because, the last three or four games, he's actually been double-teamed on the glass. But with Blake on the floor, you can't do that. I think that D.J. will possibly rebound even better - if that's possible."